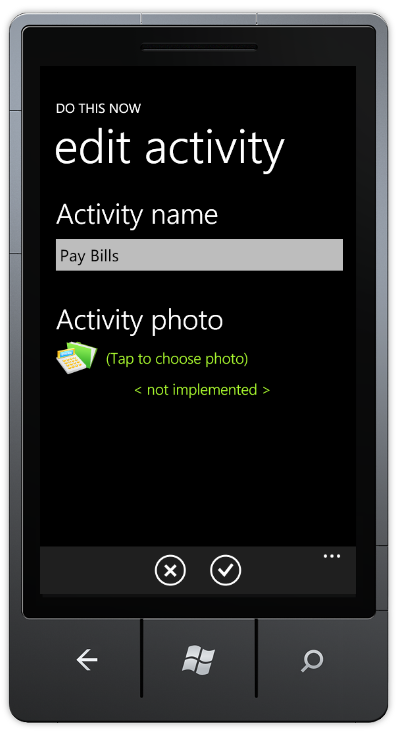 In my latest Windows Phone 7 workshop that I presented in UniBonn, I promised that we will have a contents. By now two people created and submitted their applications. What makes me happy even more than their interest is the fact that they used techniques not presented in the workshop – location services, WP7 sensors, persistence in IsolatedStorage database as alternative to IsolatedStorage file. 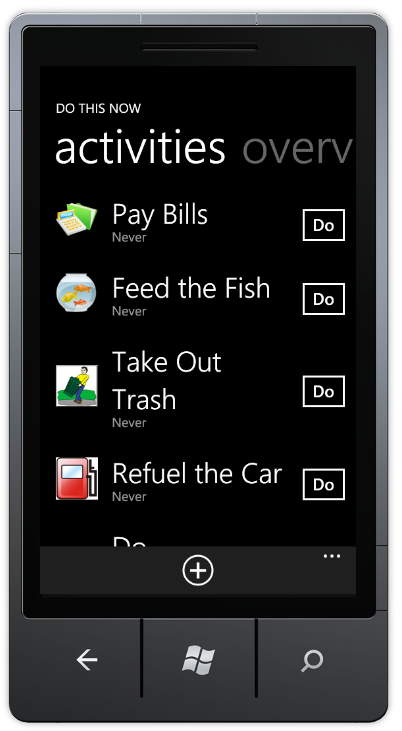 While reading the code, I realized that would have been better to have a two day workshop in which to also present and demo other features of the Windows Phone 7 like geolocation and its mocking, shakes, tile updates, push notifications being only few of the examples. But fortunately there is still time, so I will plan this for my future workshops. 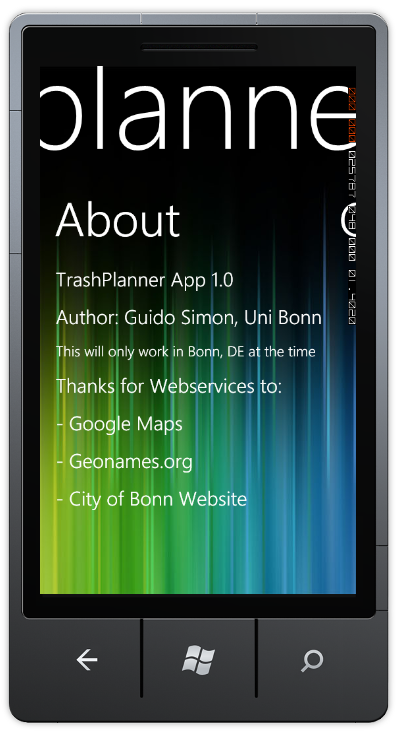 Description (by app author): It's a trash planner for the city of Bonn. 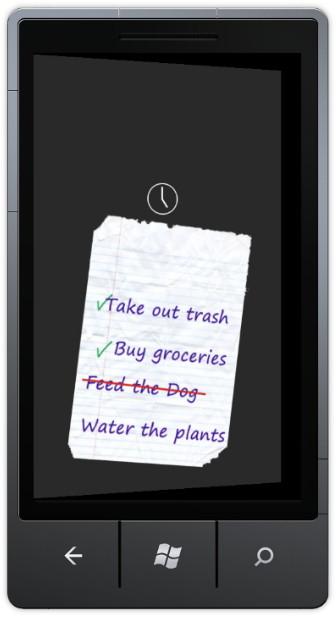 I personally miss almost every day of garbage collection at home. 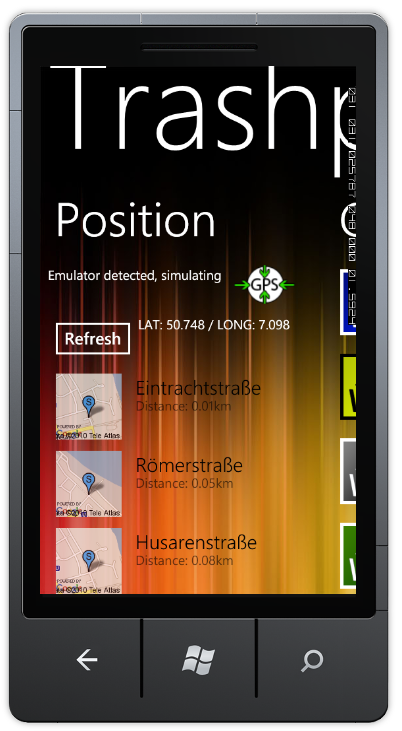 The App will help people by location their position using GPS (simulated, if the code detects to be run in the emulator). With the GPS-Position it will do a reverse geolocation lookup, to give the user the choice of the street names around his location. The list of street names calls the Google-Maps API to get an image of the street position. 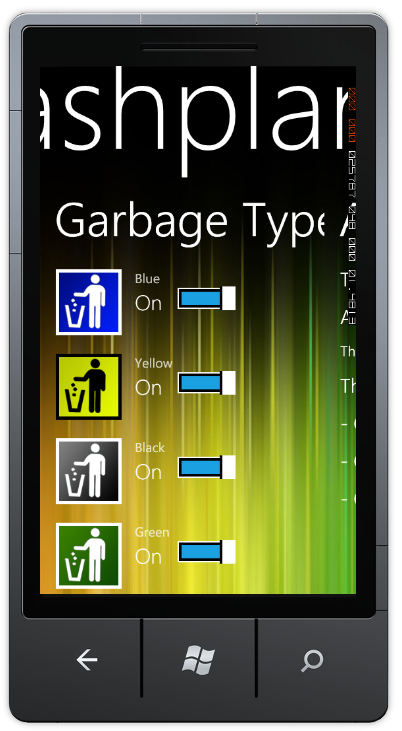 Further one can select which kind of dustbins has to be listed (i don't want to see things, that i do not use). On selection of a street the Webpage of City of Bonn is queried, and parsed using some regular expressions, to list all collection dates, that match my street, my selected dustbins – and of course are not in the past. Of course all settings will be saved for the next start, so that the positioning has not to be done again. Sources can be found here. Note: the creator of the application has the copyright and the full responsibility for the files included in the archive. 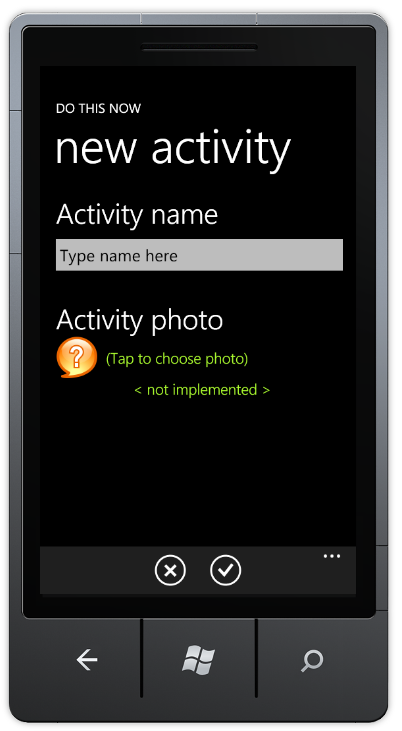 Description (by app author): The main purpose of the application was to familiarize with the development environment. 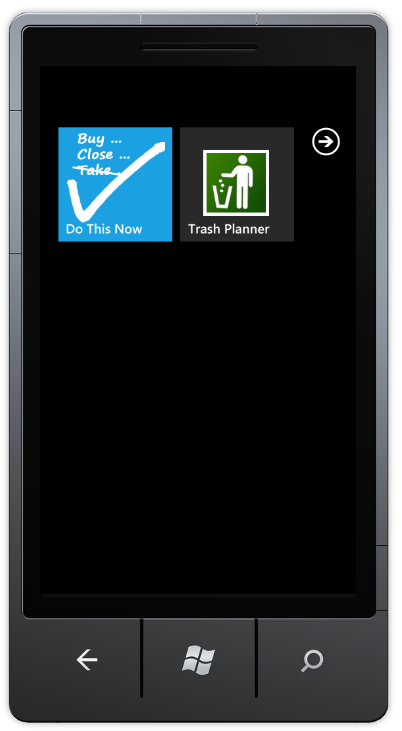 The initial idea was to implement more functionality, but from lack of time and experience some were are not completed – they are marked in the interface with a green "< not implemented>" sign. 1. The idea of the application is not new, there exists applications with a similar idea. 2. 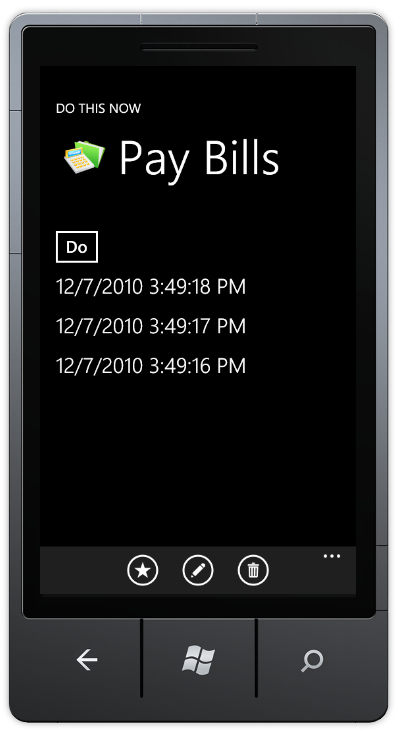 The SilverlightPhoneDatabase project used for persistence was downloaded from the Codeplex site – http://winphone7db.codeplex.com/. Sources can be found here. Note: the creator of the application has he full responsibility for the files included in the archive. Because there are only two contestants, I will change a little bit the rules by allowing to all participants that were present in the workshop to vote for one of the two applications. The vote would consist in 1 to 5 points for each application, where 5 is the best. 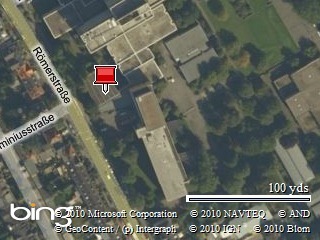 The next workshop of the Microsoft Student Partner in cooperation with the student body of Uni Bonn is coming! This time is about the basics of ASP.Net and Visual Studio 2010. The workshop provides a starting point in Web programming by many practical exercises in small groups. Aim is the development of smaller Web projects, such as photo albums or guest books.